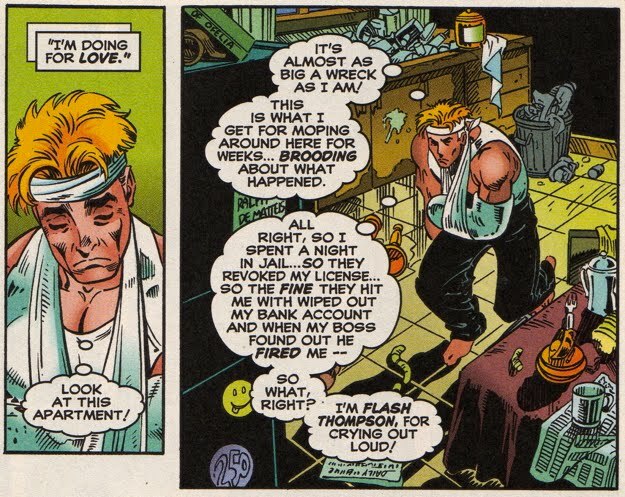 Flash Thompson has been a supporting cast member of the Spiderverse for a very long time. 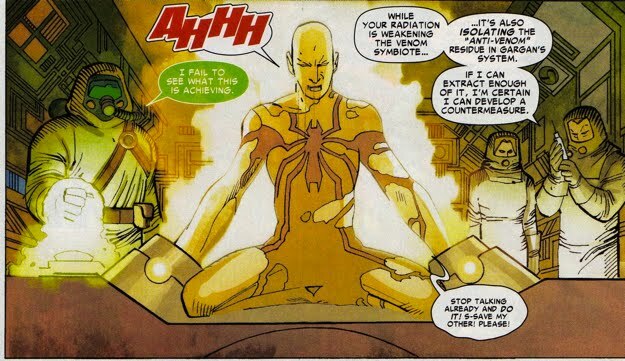 Playing the role of antagonist toward Peter whilst worshipping Spider-Man, Flash has always had a complicated history with the web-slinger. 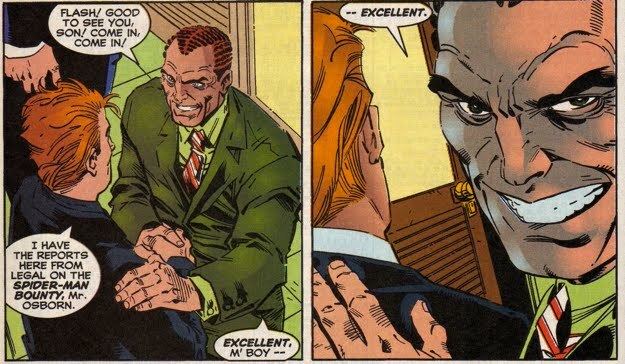 But Flash has also crossed paths with Norman Osborn on numerous occasions, the purpose of this article is to highlight the history between Norman and Flash. 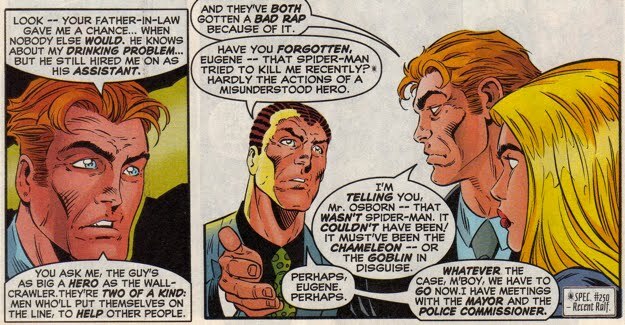 Flash's first interaction with Osborn occurred while Flash was holding a Spider-Man Fan Club meeting back in Amazing Spider-Man #17. 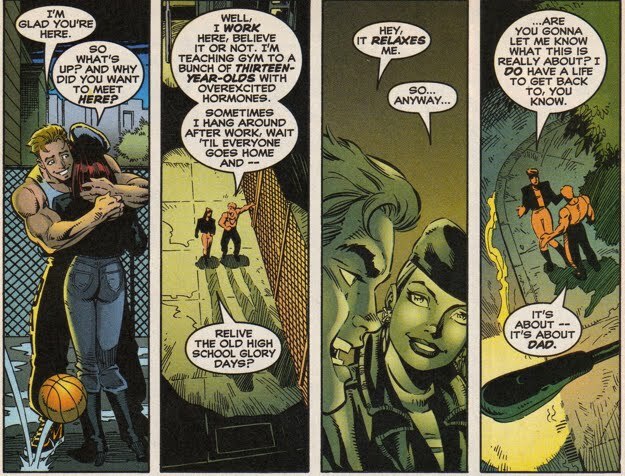 Of course this meeting was brief and Flash didn't even know Norman was the Green Goblin. 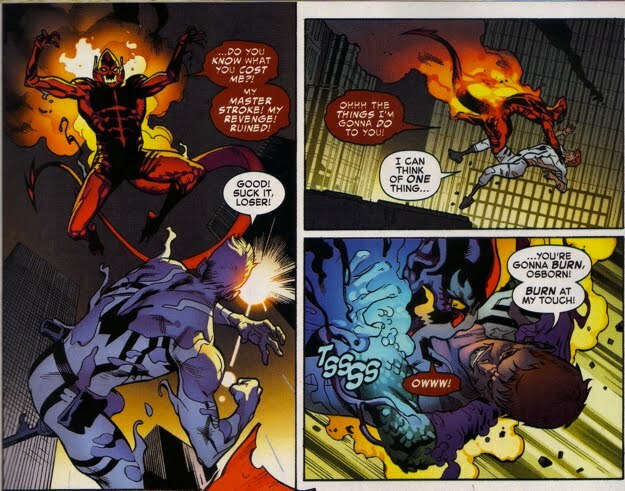 But from a technicality standpoint, this is their first meeting. 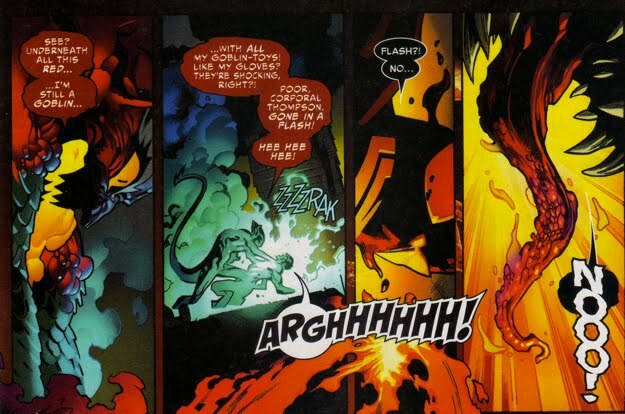 Like many of the residents of the Spiderverse, Flash met the Green Goblin before he met Norman Osborn. 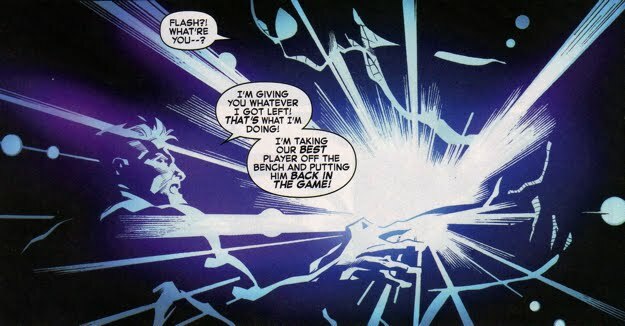 The first time Flash and Norman cross paths is for a brief instance in Amazing Spider-Man #38. 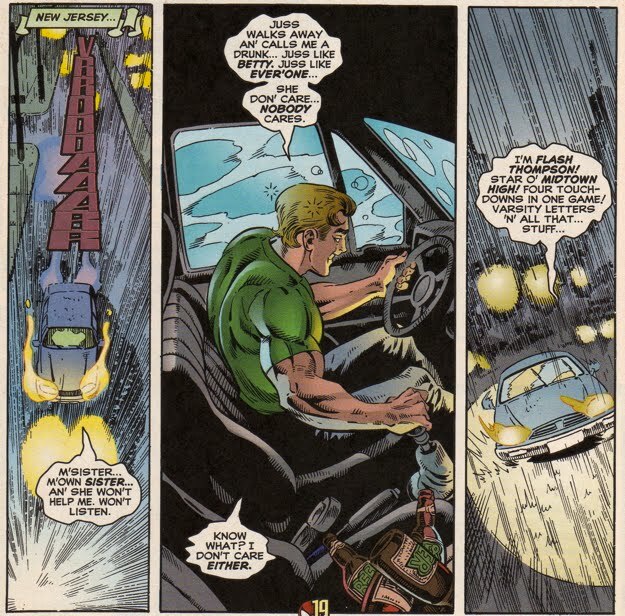 Good thing Norman put the fake goatee on after Harry and Flash drove off! 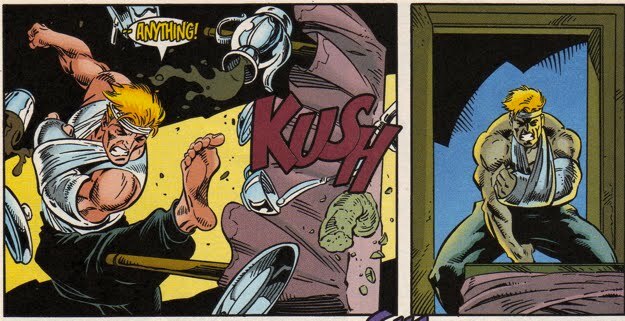 Its worth mentioning that technically Norman was not the first Green Goblin to do Flash harm, both Harry Osborn and Bart Hamilton terrorized Flash before Norman. 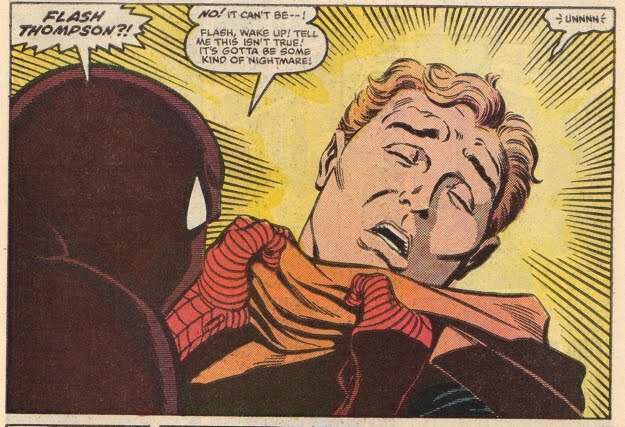 Harry kidnapped Flash (along with Aunt May and MJ) as part of his plan to attack Peter in Amazing Spider-Man #136-137. 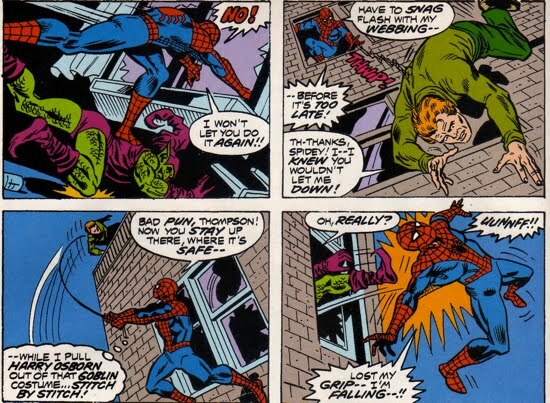 Whilst Bart Hamilton through Flash Thompson from a window to distract Spidey in Amazing Spider-Man #176. 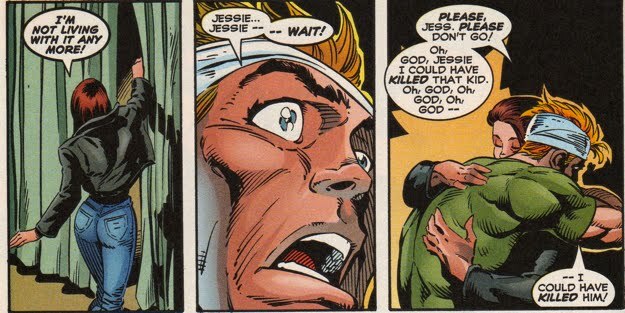 This is an interesting scene because Peter learned from his mistake with Gwen Stacy at the Brooklyn Bridge and snags Flash earlier in his fall, preventing the whiplash effect that killed Gwen. 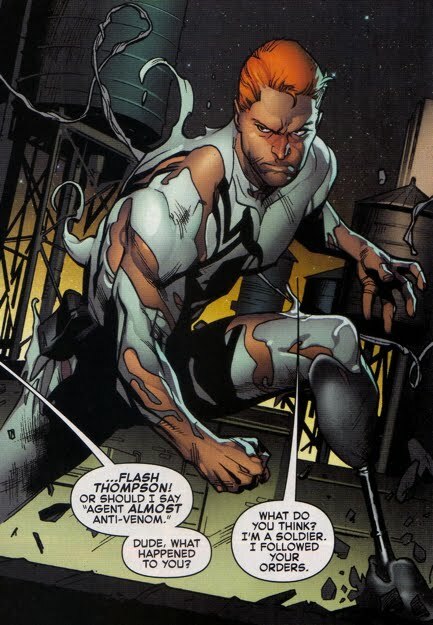 Although only indirectly related to Norman via Kingsley, Flash was framed by the original Hobgoblin in Amazing Spider-Man #276. 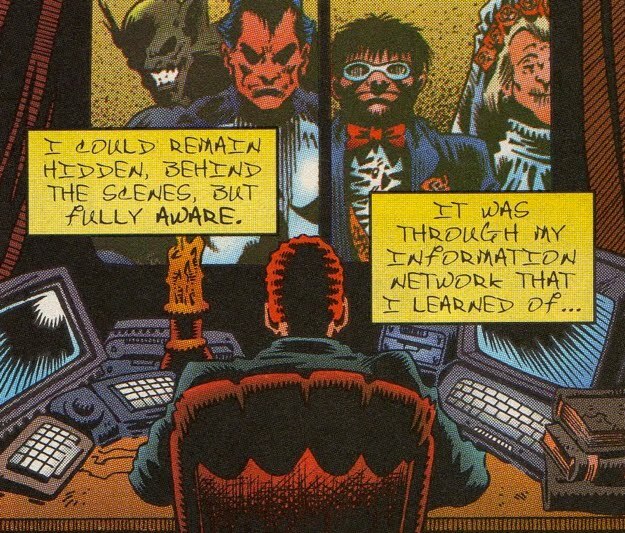 Undoubtedly Norman was aware of this since he was keeping tabs on everybody via his superior information network that he established whilst in Europe in exile. 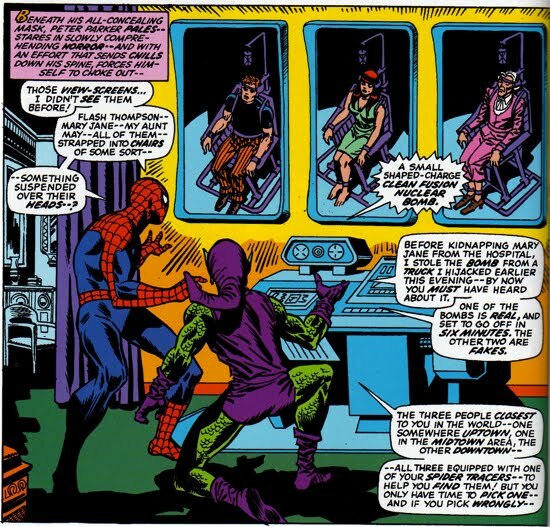 Flash would also be on the guest list when Norman returned from exile to wreak havoc upon the Daily Bugle and its staff as seen in Peter Parker Spider-Man #75. 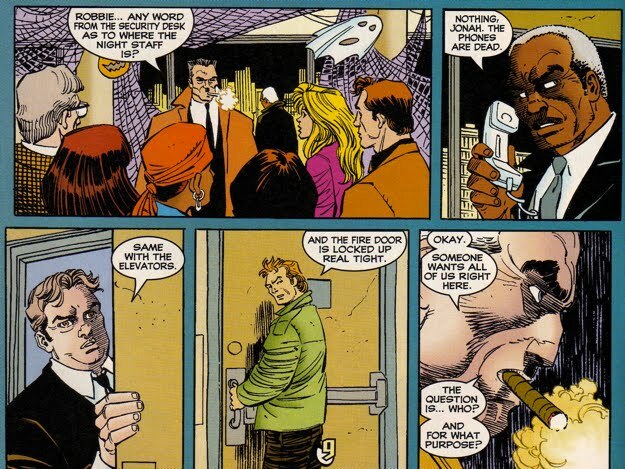 Flash was right next to Jonah as the publisher acknowledged Norman's descent into madness. 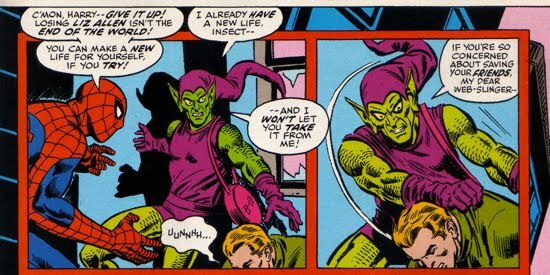 At this point, Flash would have to be aware that Norman was (and is) the Green Goblin at this point. 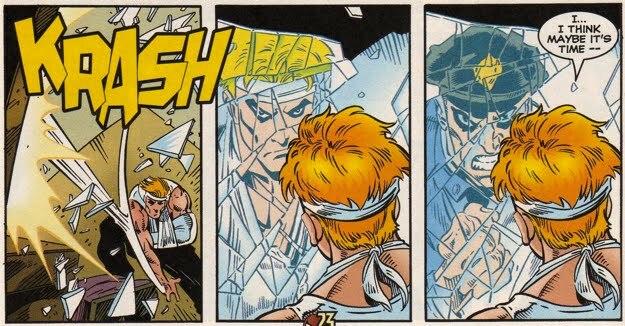 Time would pass and Flash's battle with alcoholism and his strained relationship with his father would eventually lead Flash down a dark path. 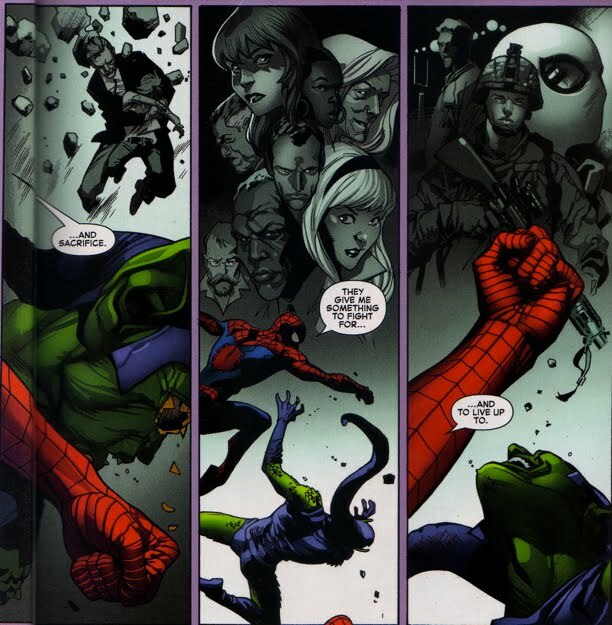 The following panels were selected from Spectacular Spider-Man #249. 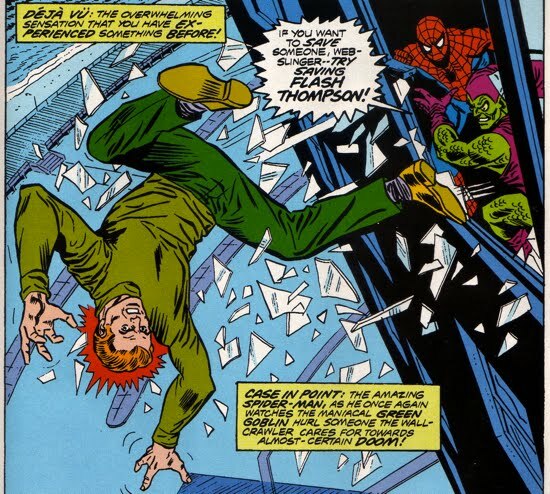 After a drinking binge sent Flash crashing into a tree, nearly killing himself and young boy, he was placed under arrest for drunk driving as seen in Spectacular Spider-Man #250. 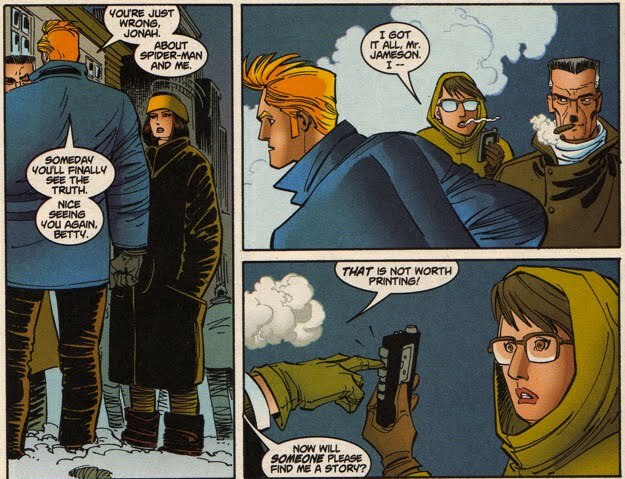 Flash hits an all-time low at this point and after some soul searching he blames his father for his most recent relapse with the sauce. 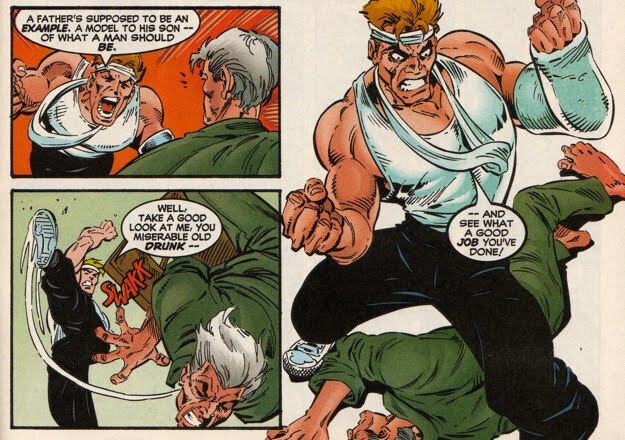 After the confrontation with his father, Flash vows to turn his life around. 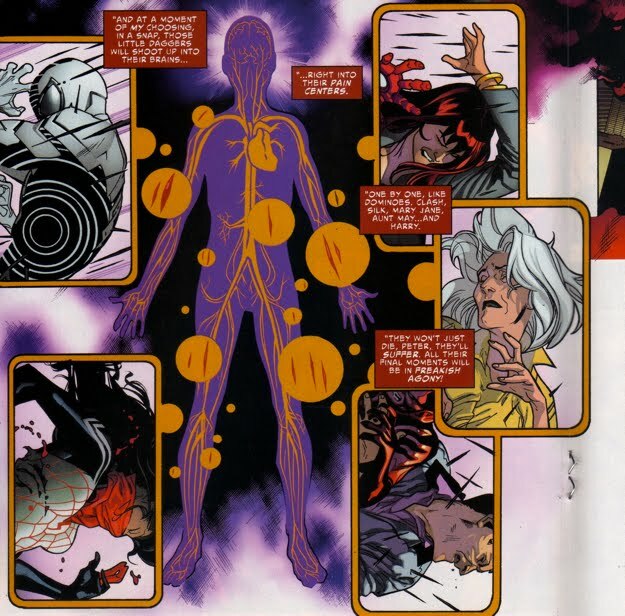 The void in Flash's life for a father figure matched perfectly with the void in Norman's life for a son to follow in his footsteps. 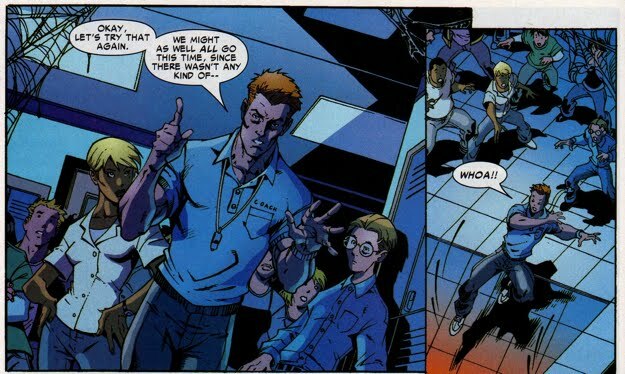 In Sensational Spider-Man #25, Norman hires Flash as his personal assistant and soon after Flash becomes convinced that all the evidence indicating Norman as the Green Goblin (including what he witnessed in person) was either not true or he simply forgot about it. 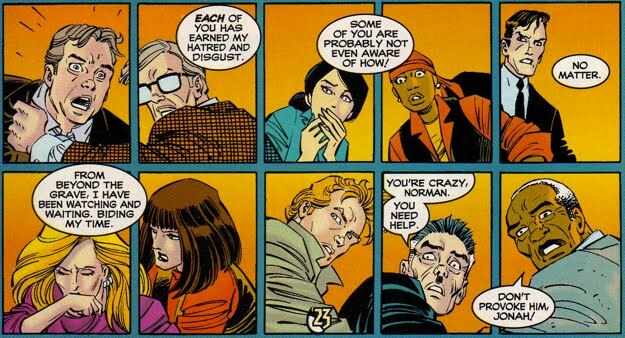 In Spectacular Spider-Man #255 we see Flash explain to Liz that Norman is just a misunderstood guy...I don't think she bought it. 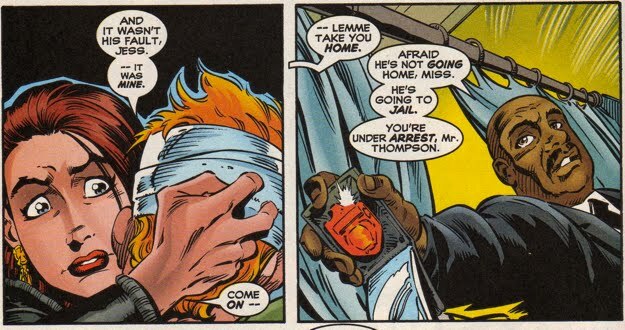 Flash, conveniently, was nowhere to be found when Norman went off the deep end after the Gathering of Five in Peter Parker Spider-Man #98. 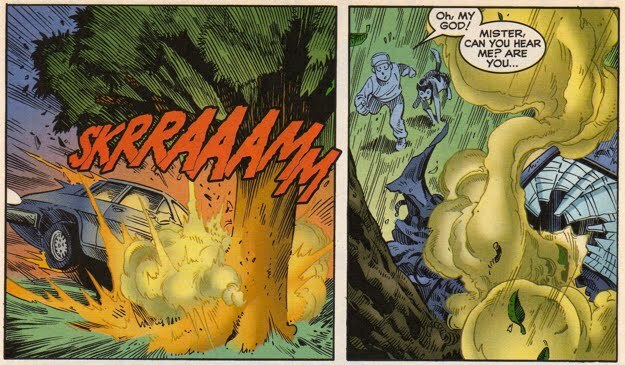 Norman went into seclusion after this incident and clearly he had cut ties with Flash. 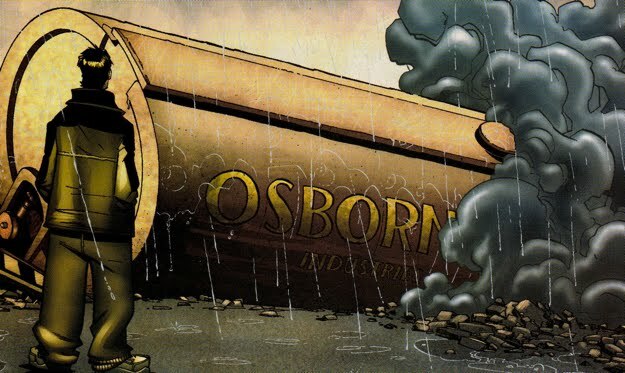 Did Flash make the connection between the disappearance of Norman Osborn and the Green Goblin's destruction of the Daily Bugle? I'd hope so, but there's no evidence to suggest that he was aware of the connection. 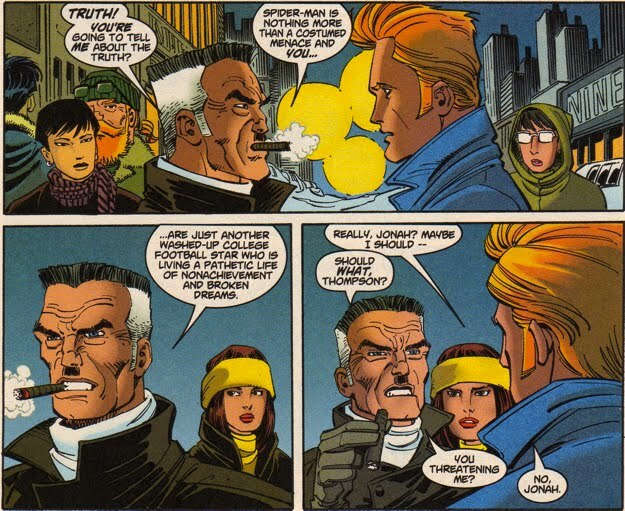 Eventually Flash returned and confronted J. Jonah Jameson in Peter Parker (V2) #3. 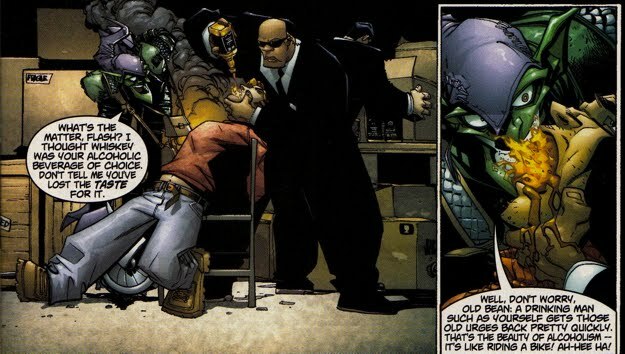 Despite Jonah's baiting him with the phrase "Norman Osborn's errand boy", there's no acknowledgement that Flash was aware that Norman was the Green Goblin. 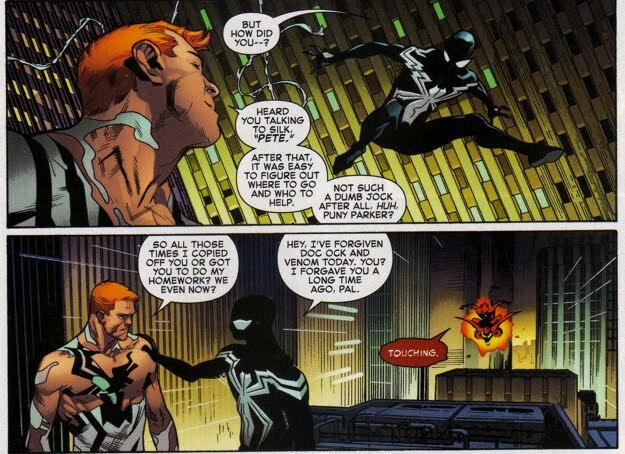 Of course, he didn't defend Norman either, so its unclear just what Flash thought about Osborn at this point. 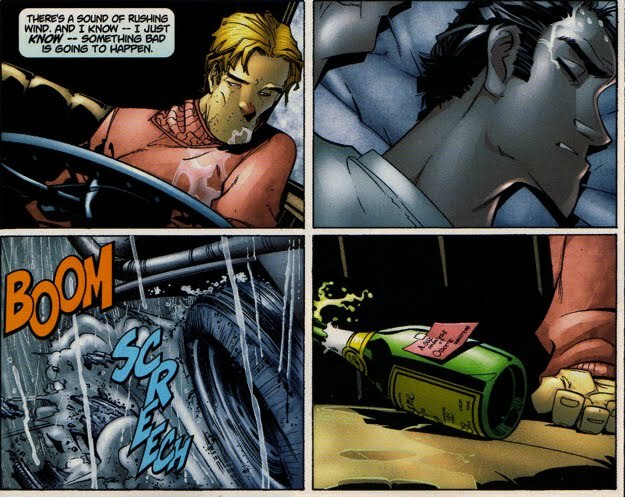 Instead, Norman force-fed him whiskey and sent him off in an Oscorp truck, which was headed straight for Midtown High. 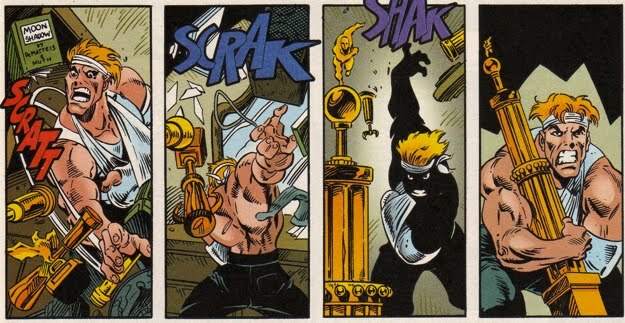 This accident left Flash comatose, a state in which he would remain for an extended period of time. 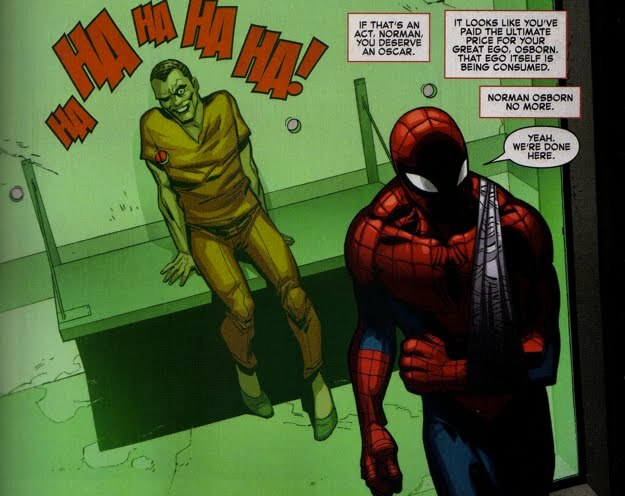 All thanks to Norman Osborn. 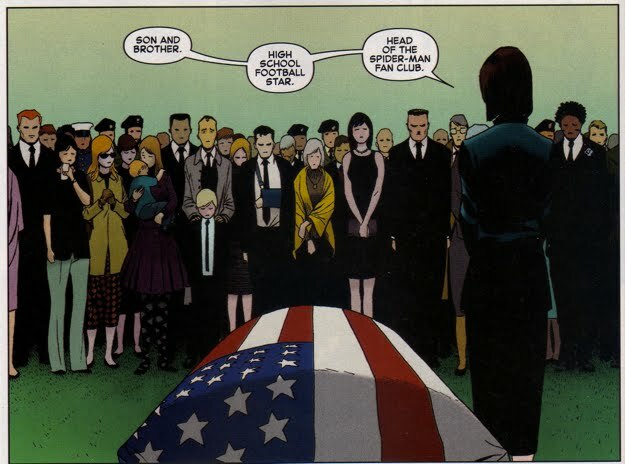 Flash would eventually wake from his coma and become the gym teacher at Midtown High School, albeit with a slightly compromised memory. Soon after, he joined the army (once again) and served in the Iraq War. 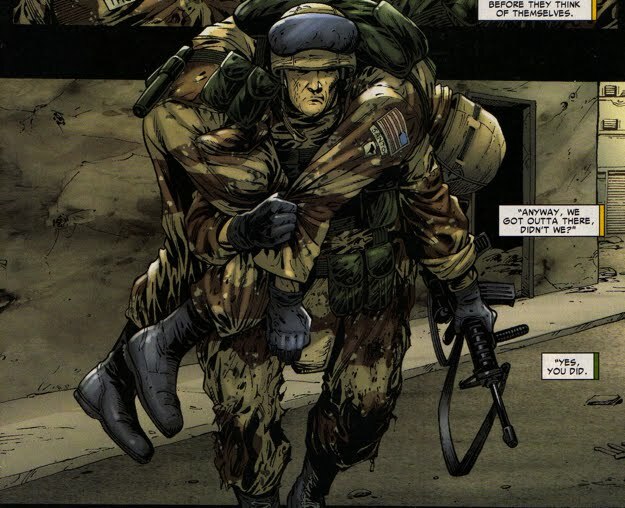 Flash would demonstrate great valor during his service and despite taking on heavy enemy fire, he was able to save his superior officer during an attack. 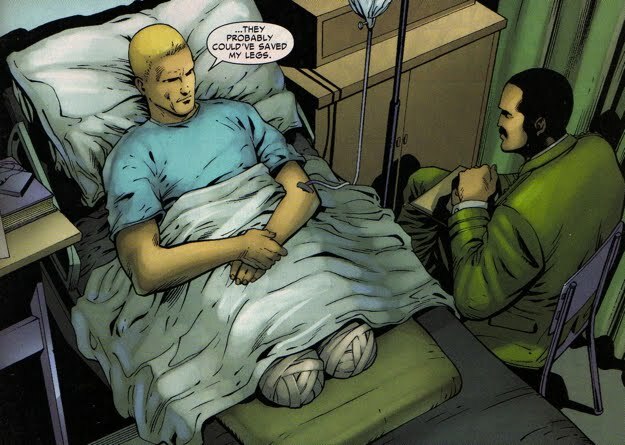 His actions would lead to a recommendation for the Medal of Honor, unfortunately they also cost him his legs, which had to be amputated. 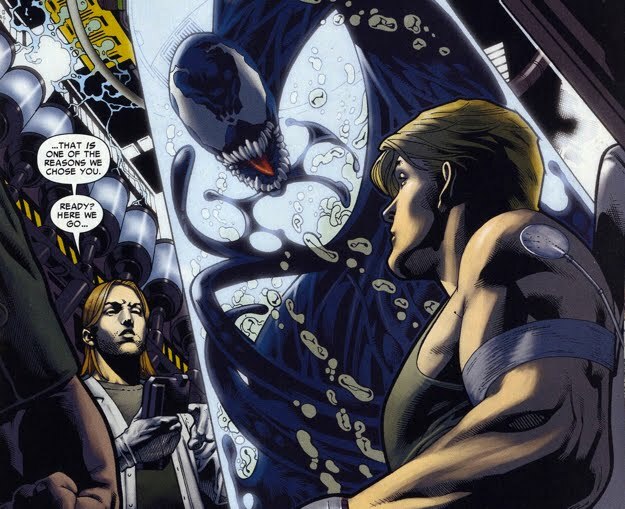 Without the ability to walk, Flash took the opportunity to join with the Venom symbiote and work as an ally of the U.S. government. 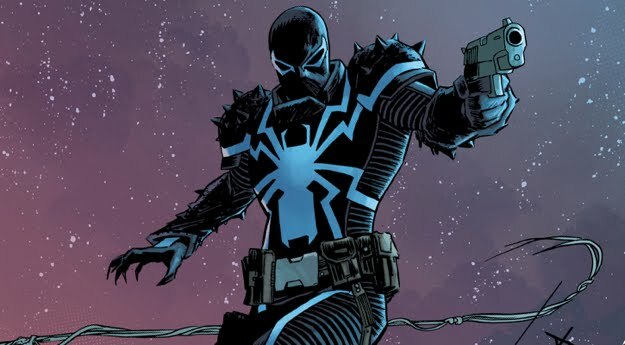 And Agent Venom was born! 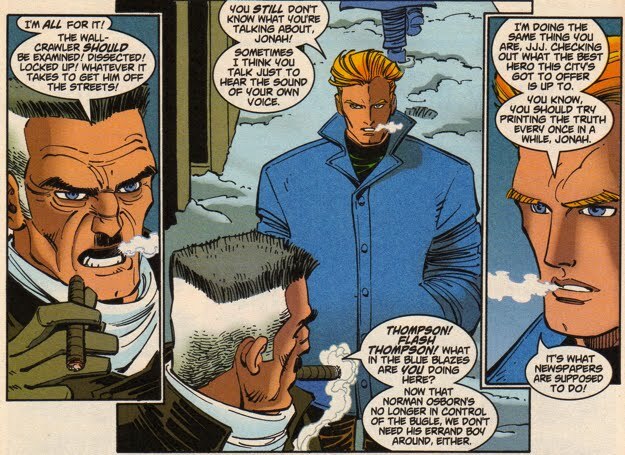 When Norman Osborn (who had bonded with the Carnage symbiote) had kidnapped J. Jonah Jameson, it was Flash Thompson who freed the former Daily Bugle publisher. 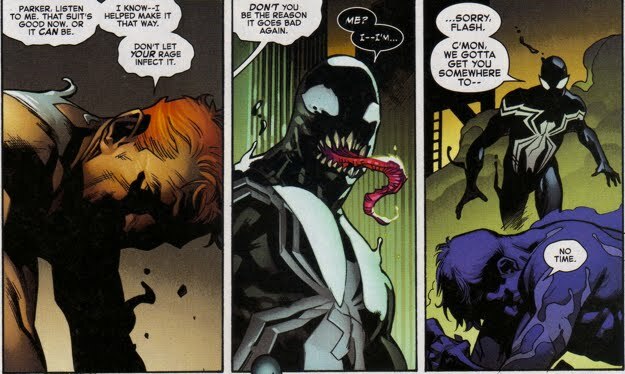 Flash then set his sights on the Red Goblin (aka Norman Osborn) and he was the only hero to actually inflict damage upon the Goblin-symbiote-hybridized menace. 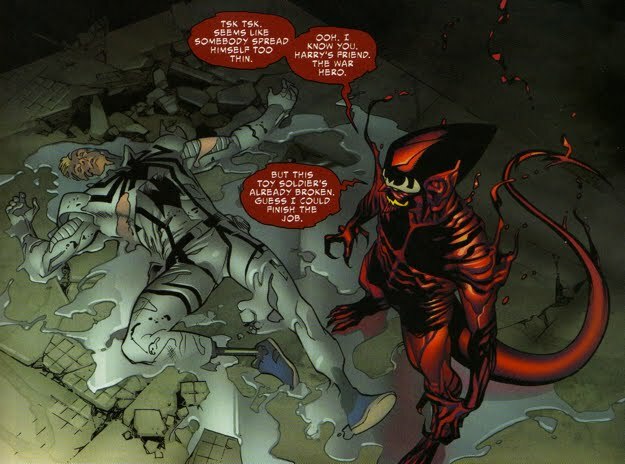 The Anti-Venom suit was able to dissolve and destroy some the Carnage symbiote, weakening Osborn's attack. 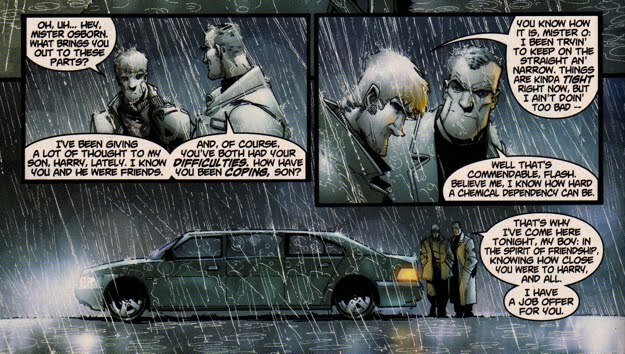 Norman was unaware that he had this vulnerability. 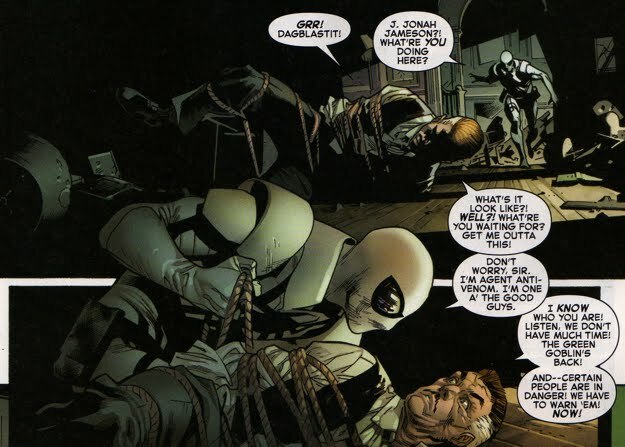 Osborn's naivete toward the Anti-Venom symbiote is surprising, considering how closely he worked with it during the New Ways to Die story arc (the panel below is from Amazing Spider-Man #572). 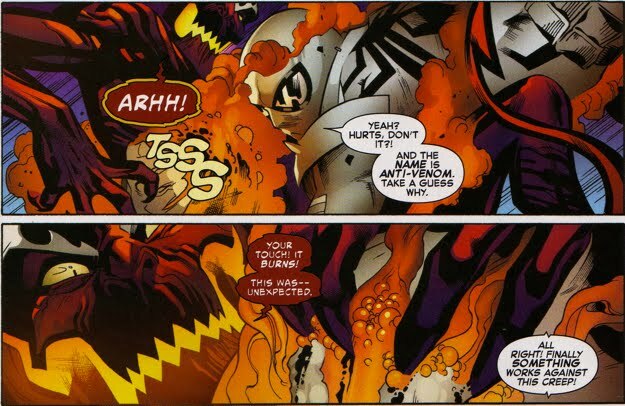 Nevertheless, as Agent Anti-Venom was healing his fallen comrades, the Red Goblin took the opportunity to strike back, severely injuring Flash. 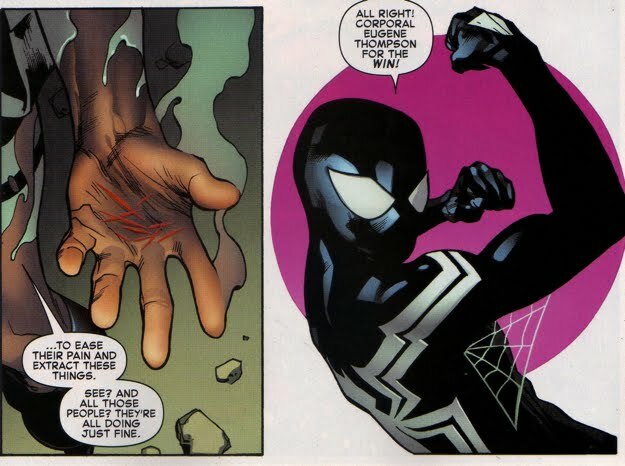 Part of Norman's master plan against Spider-Man and his loved ones was to lace them with Carnage shrapnel, basically tiny shards comprised of the symbiote. 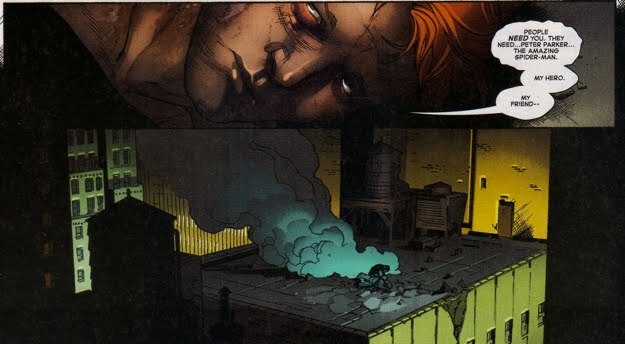 At Norman's command he would unleash the shards to provide the victim with the most painful death possible...how nice! 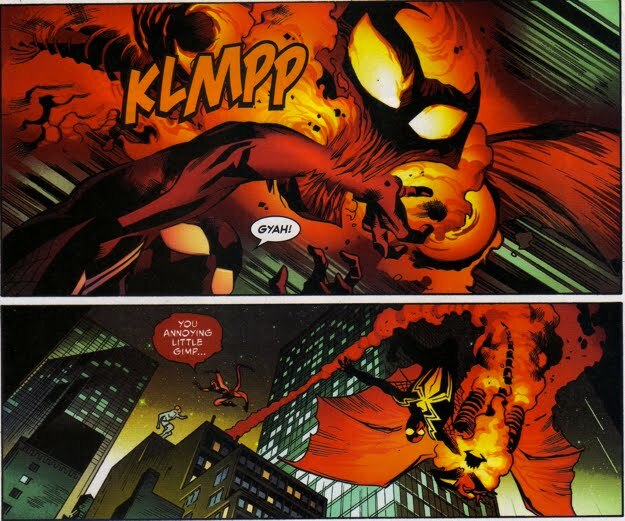 Norman did take the news very well so he uses his demonized-Goblin Glider to remove Spider-Man from the rooftop. 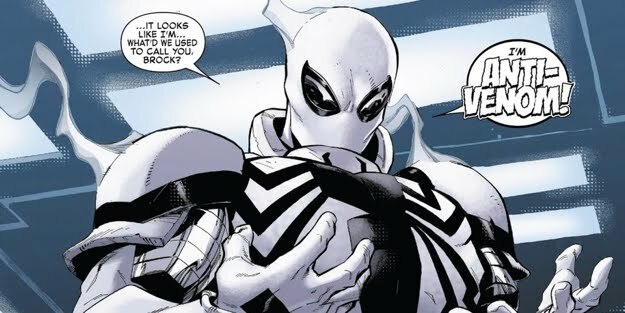 Then he pounces on Flash and unleashes an onslaught of Goblin electro-blasts and symbiote fury...the Anti-Venom suit was quite compromised and could not provide Flash with an adequate defense. 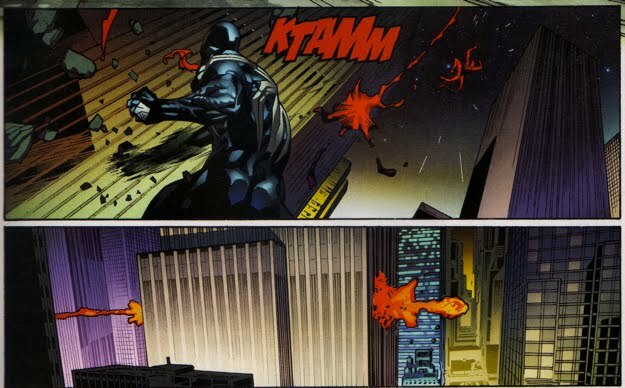 Flash had been the victim of so much of Norman's brutal and senseless violence, and ultimately his life was lost at the hands of the Green Goblin. 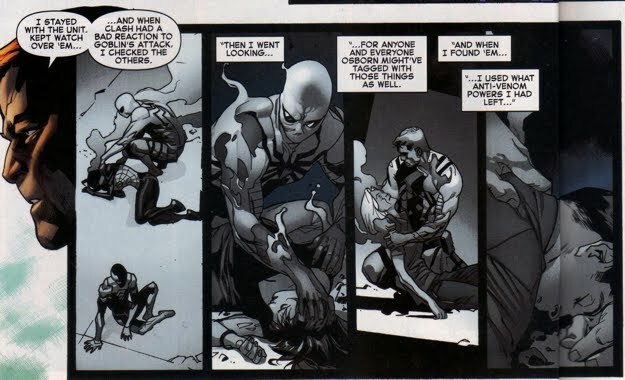 But Flash's heroic actions at that time as Agent Anti-Venom saved the lives of so many innocent people...he was a true hero indeed!